Flawless makeup doesn't just happen. It requires patience, precision, and great lighting. From dramatic winged liner to a dark smokey eye, the right tools can simplify even the most advanced creations. Magnified makeup mirrors with built-in lighting are a prime example - as they make it possible for beauty lovers of all skill levels to excel. One common makeup mistake is applying too much product. 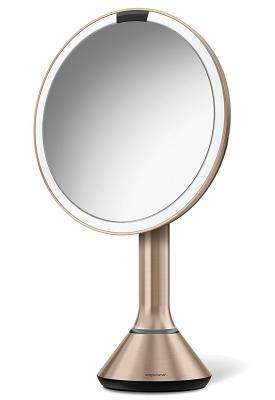 However, according to an article in online magazine The Strategist, this was dubbed the best magnifying mirror with light and allowed users to apply cosmetics more mindfully. Since the mirror shows every line, pore, and imperfection (which may be a little scary at first), you can identify where product is needed and where it is not. Additionally, video reviews praised the fact that the mirror turns on automatically when you get close and that it mimics natural sunlight. Though this is a well-reviewed product overall, there is one drawback to keep in mind: the price. 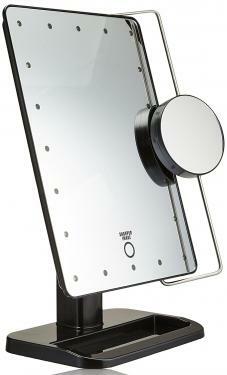 Not everyone is willing to spend $200 for a makeup mirror, regardless of how it works. (Or $250 for the pro version, which includes access to an app that controls color variants and a 10X magnification add-on.) To avoid feeling disappointed, consider your budget before you start shopping. There are several reasons to add this mirror to your makeup room. For starters, the price is ultra-affordable, which makes it a great starter mirror, gift idea, or budget-friendly option. It is also easy to move from place to place, so you can apply makeup wherever you prefer. 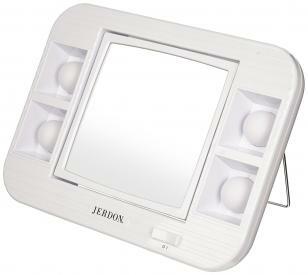 Online reviews of the Jerdon makeup mirror praised the quality of the lights and the fact that there is no distortion on the magnified side. Something to be mindful of is possible flashing light. 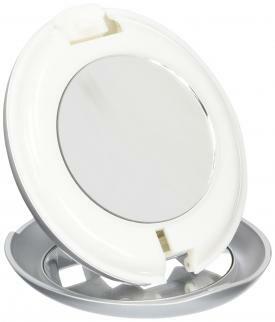 A few users found that some lights would blink on and off, and since the bulbs cannot be removed, the mirror was no longer usable. Hold on to that manufacturer's warranty to ensure that you can get a replacement if this happens to you. This mirror stands out from many options on the market thanks to its appearance. It has a modern design that suits a wide array of home decor styles and preferences. Not only is it stylish, but once it is attached to the wall, it's simple to use and makes day-to-day tasks like makeup application, your skin care routine, and even eyebrow plucking quick and easy. There are potential drawbacks to keep in mind. The first is the price, as it is on the higher end of the price scale. This is more of a luxury item rather than a basic model. Installation is another issue to be aware of. Wall-mounted mirror installation can be complicated if you do not know what you are doing. There is no doubt about it: this is one beloved beauty. In fact, it made a list of the best reviewed lighted makeup mirrors with an average Amazon rating of 4.6 stars out of 1655 total reviews. Consumers were impressed by how lightweight and portable it was (and the fact that it comes with a velvet bag for travel), the suction cup feature that locked the mirror into place, and the quality of the product itself. It has been referred to as well-made and durable. Though negative feedback seems to be rare, some users did not like the standard light setting. They would have preferred a dimmable option to change the intensity of the lighting as desired. 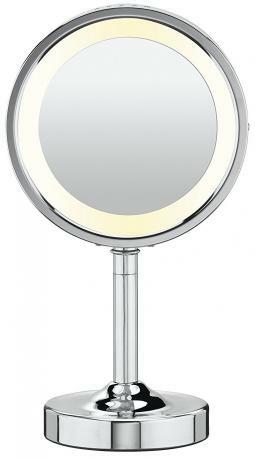 If this is a feature you are looking for, be sure to weigh the pros and cons before purchasing this magnified mirror. 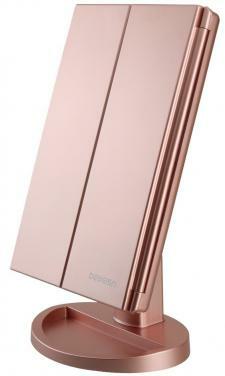 The rose gold color gives this product a trendy appearance that can complement any space with ease. Reviews on Amazon also like the fact that you can change the intensity of the lighting, the quality of the mirrors, and the affordable price tag. They enjoyed the fold-out mirror design as well as the fact that it allows you to see the face from many different angles. There are some negative reviews to factor into your decision as well. For instance, some people felt that the mirror did not give off enough light. However, other reviewers pointed out that holding the button for a few seconds will make the lights appear much brighter. This product has plenty of fans thanks to its on-the-go size. A YouTube video review highlighted just how compact it was, and how easy it was to take with you. That makes it an ideal choice for your purse or to take with you when you travel. The review also mentioned that this is ultra lightweight and the LED bulbs do not need to be replaced. While the small size may be a selling point for many beauty lovers, some might not like the idea of needing multiple makeup mirrors. It means investing in one for the home and one to travel. Think about your lifestyle before you add this gem to your collection. This mirror is no stranger to solid reviews. It was actually included in an E! News article about makeup mirrors with lights. It also has received great feedback from consumers, with Influenster users enjoying the variety of having two magnification levels, the overall quality, and how much easier it made makeup application. By far the most common critique of the mirror had to do with the lighting. Many people found the light to be too dull to really make a difference - and mentioned that the batteries died quickly. Factor in your own preferences as well as the long-term cost of batteries before you buy. This product has garnered a lot of praise, with Dreams of Velvet blog mentioning the size of the mirror, the many lighting options (it can be very bright or dim, according to your preferences), and the modern touchscreen design. Reviews on the Target website also mention the stability of the mirror, portability, and the handy base tray. There are some negative aspects to consider. Though there were many positive reviews, criticism centered around the lighting itself. While some people enjoyed the fact that there were different lighting levels, others were unimpressed with the quality of the lights. 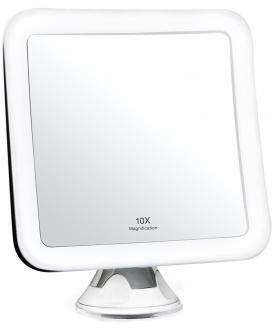 Some users were also unhappy with the size of the 10X magnification mirror, as it is an add-on, rather than the entire mirrored surface. A mirror with great lighting can make application much easier. Lighted mirrors are able to eliminate shadows caused by overhead lighting. That means better looking makeup that stands out for the right reasons! Magnified mirrors make it easier to see exactly what you are doing. (This is especially helpful if you wear glasses.) That increases precision, which in turn makes tasks like eyebrow maintenance, applying false eyelashes, and winged eyeliner much simpler. They are extremely versatile and can be used almost anywhere. From the bathroom to the living room, in the car, or on vacations, these mirrors can go wherever you want them to. Magnified mirrors clear up counter space, with many models folding up, attaching to the wall, or coming with small storage trays. There are so many ways to incorporate them into your current space. 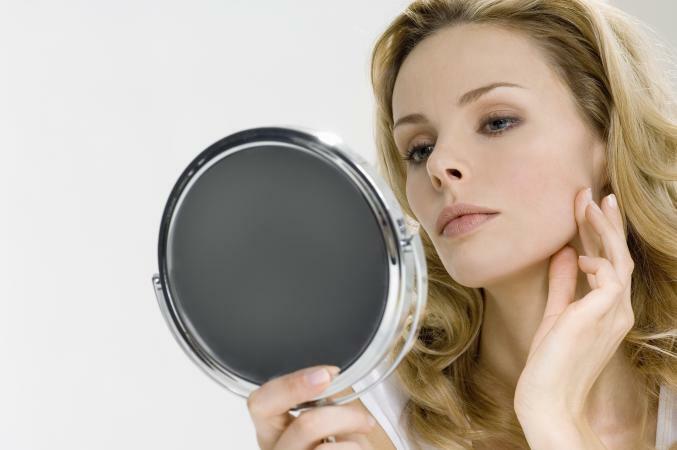 Finding the perfect makeup mirror is easier than you think. Before you purchase anything, take time to think about what you really need. Ask yourself questions like: Where do you apply your makeup? Do you travel a lot? How much magnification do you want? What type of lighting do you prefer? 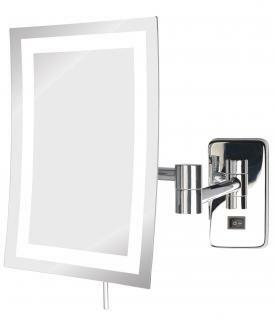 Once you know what you want from a lighted mirror, you can begin to narrow down the many options. The right mirror can transform your daily routine. Not only are these magnified mirrors convenient to use, but they streamline makeup application and can help improve your makeup skills. So start shopping, weigh the pros and cons, and find the design that works for you.